BIOQUANT has several unique tools to help you define the Tissue Volume quickly and consistently. The Irregular Region of Interest tool helps you define the trabecular compartment as a shape that is a constant distance from the cortical shell and growth plate. The Rectangular TV tool creates a rectangular TV of specific dimensions, positioned a fixed distance from the growth plate. Threshold the as much of the bone as you can. Click the Clean button to remove threshold in the marrow. Click the Erode and Dilate buttons to smooth edges. The threshold is ready for measurement. All of these steps can be recorded into a Batch Script for quick implemenation. BIOQUANT uses the specific coloring created by stains to identify different biological structures. For example, in the images above, the blue color is associated with mineralized bone. The red color is associated with osteoid. The dark red to black color is associated with the marrow. Clicking once on a color and scrolling the mouse wheel up and down automatically selects a range of colors associated with the structure. These color ranges can be saved and retrieved automatically by the software when different data should be collected. For example, selecting the Bone Surface array automatically retrieves the threshold associated with bone. Once a thresholding has been created, BIOQUANT offers simple, fast, and scriptable tools to enhance it. Clean, for example, removes background noise from the threshold be automatically deleting small objects. Erode and Dilate smooth out the surfaces of the bone. Draw and Erase let people make changes directly to the threshold with a brush of adjustable size. Using the Measure Cells measurement type, BIOQUANT can identify cells by color, size, and shape. Therefore, BIOQUANT can help automate the counting of adipocytes by automatically identifying small, white, round shapes. Additionally, BIOQUANT will automatically skip partial cells that appear at the edge of the field of view. Finally, BIOQUANT will automatically avoid counting the same cell twice, even if it appears again in subsequent overlapping fields of view. TRAP staining is commonly used in rodents because it helps simplify the detection of osteoclasts. Not all cells that express TRAP are osteoclasts, but it's a good place to start. It's easiest if the TRAP staining is applied to a section which is approximately serial to the trichrome section. This way, the referent data from the trichrome section can be used to normalize the osteoclast data. Based on TRAP staining, BIOQUANT uses automatic thresholding to identify TRAP positive cells. Minimum size filters help differentiate between TRAP positive monocytes and osteoclasts. Calcein labeling is common for visualizing mineralizing surfaces in rodents. Sometimes it can be combined with alizarine red labeling to differentiate between first and second labels. It's easiest if the section used for labeled surface measurements is approximately serial to the trichrome section. This way, the referent data from the trichrome section can be used to normalize the labeled surface data. 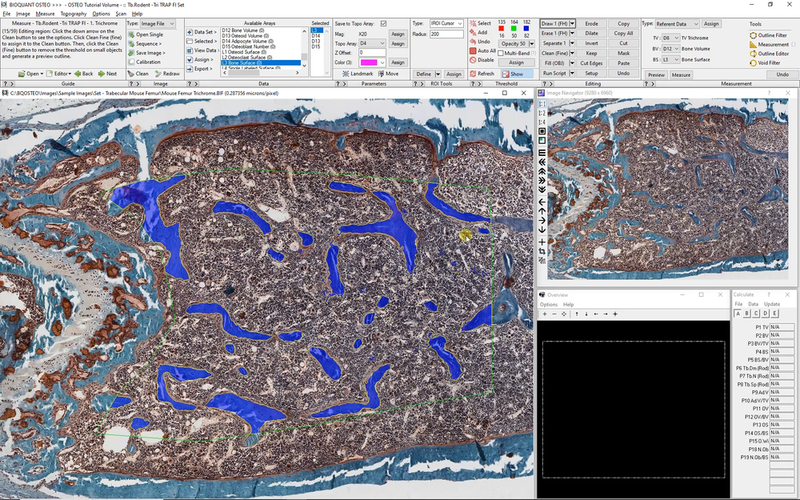 Thresholding tools in BIOQUANT OSTEO allow it to identify bright labeled surfaces. This helps differentiate labeled surfaces from auto-fluorescence. Adiponectin regulates various metabolic processes including glucose flux, lipid breakdown and insulin response. We recently reported that adiponectin receptor1 (adipoR1) activation by a small molecule reverses osteopenia in leptin receptor deficient db/db (diabetic) mice. However, the role of adiponectin in bone metabolism under the setting of post-menopausal (estrogen-deficiency) osteopenia and associated metabolic derangements has not been studied. Metabolic syndrome and osteoporosis share similar risk factors. Also, patients with diabetes have a higher risk of osteoporosis and fracture. Liver manifestations, such as non-alcoholic steatohepatitis (NASH), of metabolic syndrome are further aggravated in diabetics and often lead to liver failure. Our objective was to create a rat model of human metabolic syndrome and determine the long-term impact of early-onset T1D on bone structure and strength in obese growing rats. Combinations of anabolic and anti-resorptive agents have potential to improve bone density more than either agent alone. In this study, we determine the combining effect of anti-IL17 antibody and PTH (1-34) in mitigation of ovariectomy induced bone loss. Ovariectomized BALB/c female mice were treated with anti-IL17 and iPTH monotherapies and their combination. Combining anticatabolic agents with parathyroid hormone (PTH) to enhance bone mass has yielded mixed results in osteoporosis patients. Toward the goal of enhancing the efficacy of these regimens, we tested their utility in combination with loss of the transcription factor Nmp4 because disabling this gene amplifies PTH-induced increases in trabecular bone in mice by boosting osteoblast secretory activity. Periods of disuse or physical inactivity increases bone porosity and decreases bone mineral density, resulting in a loss of bone mechanical competence in many animals. Although large hibernators like bears and marmots prevent bone loss during hibernation, despite long periods of physical inactivity, some small hibernators do lose bone during hibernation. Browse additional citations of BIOQUANT in osteoporosis research.